Altitude seems to suit Jeremy Powers (Rapha-Focus). He won Saturday in Longmont – elevation 4,979 feet – at day one of Altitude Adjustment Cross, a primer of sorts for cyclocross national championships which rolls out next week in nearby Boulder. That’s his second consecutive win during three outings in Colorado this season. 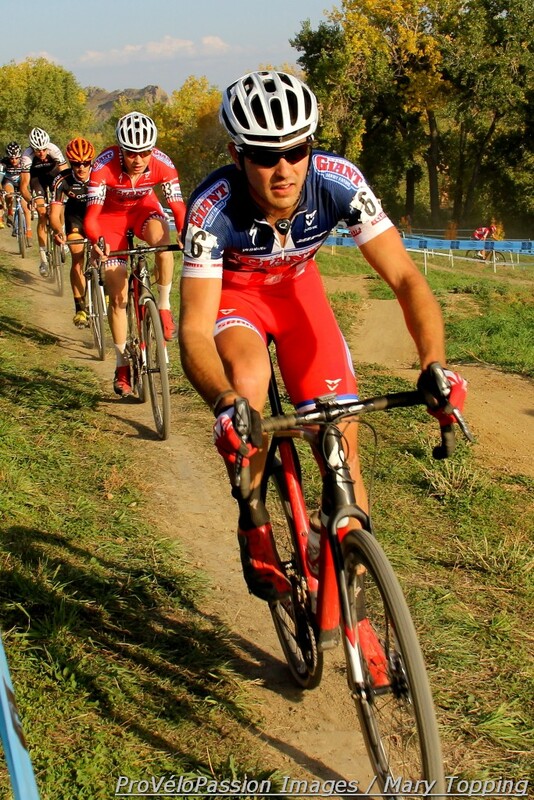 He won the Boulder Cup in October and claimed a come-from-behind second place at the Colorado Cross Classic. The Longmont race began under light snow which supplemented the inches of white that had fallen earlier in the day. Yannick Eckmann took the holeshot. His California Giant Berry Farms/Specialized teammate Logan Owen followed with Powers third wheel and junior Spencer Petrov (Sophisticated Living p/b Bob’s Red Mill) fourth as the field exited the pavement and turned onto turf. Cal Giant’s U23 duo controlled the race for two laps. 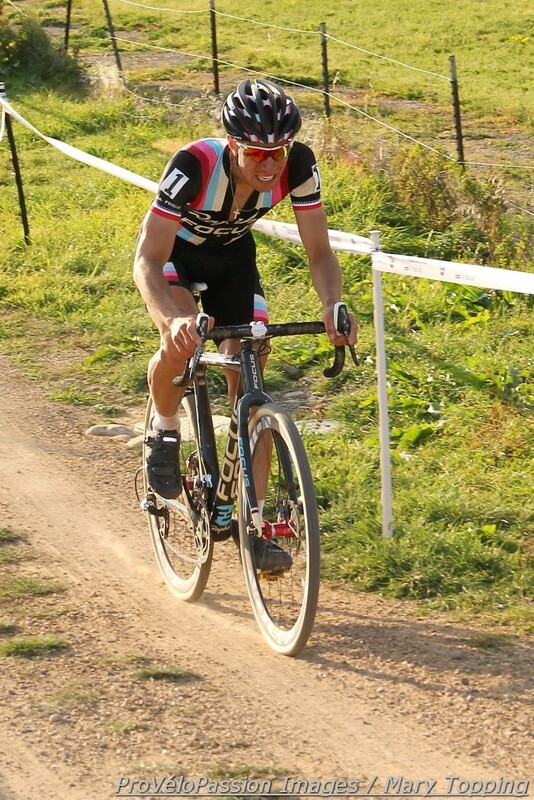 They’ve both enjoyed successful seasons to date versus more senior American elite riders, finishing pretty regularly in the top five or ten against guys like Powers and Tim Johnson and Ryan Trebon of Cannondale p/b Cyclocrossworld.com. On Saturday they once again demonstrated their strength. But Powers’ consistency on the increasingly glacial course with multiple off-camber sections helped him move from third on course into a lead he held until the end. As the second lap concluded Eckmann went down near the finish line. Powers took the opportunity to advance into second position. At the head of the race, Owen gained on Powers but his gap evaporated when he crashed in a corner. While Powers worked on building distance to Owen, Raleigh-Clement’s Jamey Driscoll gradually moved up from tenth at the first turn to fifth, riding near teammate Allen Krughoff. In the second half of the race Driscoll pulled into third and finished there just 15 seconds behind Owen. Krughoff came in fourth just after Driscoll. Eckmann placed fifth. Pete Webber (Boulder Cycle Sport) rode well and finished sixth. The current Washington state elite champion, Kevin Bradford-Parish, started fast and maintained a steady pace to net seventh. For the youngest juniors in the race, Petrov and Gage Hecht (Team Specialized Racing), Saturday presented an opportunity to compare themselves ahead of the championship 15 – 16 race this coming Friday. Hecht finished tenth. While Petrov drifted back in the second half of the race and came in 32nd that’s an anomaly of sorts given his strong season; Friday still promises an exciting contest between the two. And when it comes to the big guys’ national championship showdown next Sunday, Powers is looking hard to beat at Valmont Bike Park.